This infrared image of the G2 object orbiting the supermassive black hole Sagittarius A* at the center of the Milky Way was captured by scientists using the W.M. Keck Observatory in Hawaii. Once thought to be a gas cloud, G2 appears to be a star cloaked in thick dust, a new study suggests. Earlier this year, astronomers watched eagerly as a cloud of gas moved dangerously close to the colossal black hole at the heart of our Milky Way galaxy — like a wildebeest wandering toward a lion. Anticipation grew over whether or not part of the cloud would pass the point of no return and be pulled, helplessly, into that gaping black maw. The destruction of the gas cloud G2 by the Milky Way's supermassive black hole (which scientists call Sagittarius A*) was set to be one of the main events of the year for astronomy. But today, Ghez isn't convinced there will be a black hole feeding event, because she thinks the G2 gas cloud isn't a cloud at all. Instead, Ghez and her colleagues suspect the weird object is actually a hidden star. If that's the case, the star could safely pass around Sagittarius A* (pronounced "Sagittarius A-star," Sgr A* for short). As late as August, Ghez's team observed that G2 is still compact, suggesting that it is a tightly bound body. "G2 survived and continues happily on its orbit," Ghez said in a statement. "A gas cloud would not do that." Sounds like a survival story of cosmic proportions, right? But not so fast. It's rare, to say the least, for a star to exist inside a gas cloud so thick that astronomers can't see the star shine. "The central feature of a star, in some sense, is that you see the photosphere," said Stefan Gillessen, a researcher at the Max Planck Institute for Extraterrestrial Physics near Munich where astronomers first identified G2, says it is still possible that G2 is a pure gas cloud. The ball has been going back and forth like this for over a year. Ghez and her group feel that their most recent results close the case; but Gillessen holds that the gas cloud theory isn't done yet. While more data often adds clarity to a scientific mystery, the observations thus far have only deepened the puzzle of G2. A computer simulation of the G2 gas cloud's encounter with the supermassive black hole Sagittarius A* at the center of the Milky Way. Astronomers using the Very Large Telescope in Chile began monitoring G2 in 2002. In late 2011, Gillessen announced that G2's close pass around Sgr A* would likely make it a snack for the black hole. Media attention came swiftly following Gillessen's announcement, and continued into 2014 as astronomers got ready for G2 to make its closest approach. Gillessen's early hypothesis suggested that there might be a bit of a light show when G2 got close to Sgr A*: A shock wave between the rapidly moving gas cloud and the gas surrounding the black hole could create bursts of X-rays or radio waves. But by July, it was clear that no fireworks were going to happen. News reporters were disappointed, and Gillessen had to rework his ideas about the nature of the mystery object. Gillessen belongs to the Infrared Group at Max Planck, led by Reinhard Genzel, who has been studying the galactic center for more than 20 years. Genzel and Ghez are credited with jointly but independently proving that the object at the center of the galaxy is a supermassive black hole. Starting in the mid-1990s and stretching into the early 2000s, the two teams raced against each other to observe the motions of stars around this Sgr A* (Gillessen joined Genzel's group in 2004). Both groups showed that the stars were moving so fast, and with such tight orbits, that their motions could be explained only by a phenomenally large gravitational force. In 2012, Genzel and Ghez shared the Royal Swedish Academy of Sciences Crafoord Prize in Astronomy for their work identifying Sgr A*. Both groups still study the galactic center, a region that Ghez and Gillessen say contains many unknowns. G2 is only one question among many that they are trying to answer. Avi Loeb, a theoretical astrophysicist at Harvard has worked on multiple models of G2 — some that show how G2 could be a star and others that explain how it could be a gas cloud. He put forth an explanation that Gillessen makes reference of in his most recent paper: That G2 is a stream of gas, siphoned off of a healthy star by the black hole. Loeb's theory says that if this is the case, G2 would actually be one in a series of gas clumps — that is, there should be more G2-like objects not far behind. The gas clouds would follow the same orbital path, like beads sliding down a string. This beading effect was seen in the debris from Comet Shoemaker-Levy 9 as it crashed into Jupiter. Despite this work, Loeb said he doesn't have a preferred theory about G2. "I learned over the years that it's better not to favor an explanation before the data comes in," he said. "Astronomy is a data-starved field. […] People sometimes fall into the trap of deciding what the answer is instead of waiting for the answer." UCLA astronomers used telescopes equipped with adaptive optics at the W.M. Keck Observatory to study the G2 space cloud, finding evidence that the cloud is actually the result of two binary stars merging together. G2: One star made from two? "One has to worry about the 'just-so' scenarios," Ghez said. "While people have gotten very excited about this gas cloud hypothesis, it is actually a less likely scenario." Science rarely offers definitive proof of anything. Instead, scientists must compile evidence until a conclusion becomes too large to ignore. For Ghez, that moment has come for G2. "I'm pretty convinced it has to be a central star," she said. "I don't see how you can get around it." 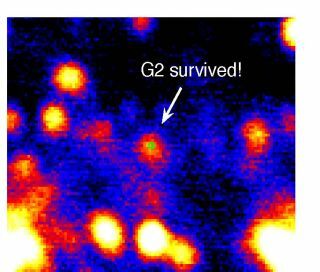 The paper that Ghez and her colleagues published in October proposes that G2 is a star made up of two other stars that merged together. Two stars that orbit each other — known as binary stars — are very common in our galaxy, Ghez told Space.com. When a third gravitational force enters the picture, like a black hole, it can disrupt the stars' regular orbit, causing them to collide. These binary merger stars have been observed previously, Ghez said, and this violent process can kick up material and create a massive cloud of gas around the new star body. This, she and her colleagues have proposed, would explain G2's seemingly impenetrable gas cloud. Going further, these types of objects might actually be very common near the galactic center, Ghez said. While G2 seems like an odd object right now, perhaps scientists are seeing the first of many binary-produced stars near Sgr A*. This series of images show the evolution of the object known as G2 between 2004 and 2013 as it stretched out while approaching the supermassive black hole at the center of the Milky Way. Originally thought to be a gas cloud, another theory posits that G2 is actually a single star that merged from two other colliding stars. If the gas cloud theory is wrong, it will most likely be the first to go down. If, by the end of 2015, G2 remains compact, Gillessen said there's "no way it's a pure gas cloud." "If that would be the observation next year then I'm happy to take it," he added. But even if the gas cloud theory is disproved, it doesn't mean Ghez's theory is necessarily correct. Her group will need to gather more evidence to support their star-merger theory. Just last week, Ghez and Gillessen met for the first time at a conference, and discussed their findings. Rather than clearing things up, Gillessen said that he's more confused now by the UCLA group's most recent work. Whereas previously it was possible to incorporate the UCLA group's findings into the gas cloud model, the observations of the two groups "seem to contradict each other," Gillessen said. He's not sure how either model can fully explain them. "It's not easy to reconcile these two observations," Gillessen said. "If that discrepancy continues to be there, I'm really puzzled."